Learn how Ultravation manufactures its indoor air quality products. Made in the USA. If you would like this video in another file format/size, please contact us at adsupport@ultravation.com. Great for show room presentations. Not formatted for viewing on websites. If you would like this video in another file format/size, please contact us at adsupport@ultravation.com. 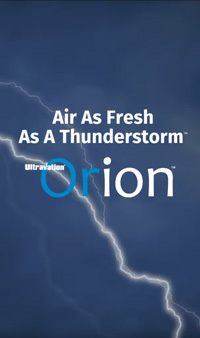 Orion™ is an ion generator for HVAC systems that reduces odors and fine particulates! Movie trailer featuring Ultravation™ Orion™. Works on 1080i high definition monitors that can be turned sideways. Movie trailer featuring Ultravation™ Orion™. Works on 1080i high definition monitors. 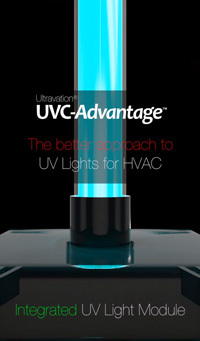 UVC-Advantage™ is a compact one-piece germicidal UV Light for a HVAC systems! UVC-Advantage™ is a compact one-piece UV Light for a new level of convenience and versatility in HVAC disinfection! Movie trailer featuring Ultravation™ UVC-Advantage™. Works on 1080i high definition monitors that can be turned sideways. Movie trailer featuring Ultravation™ UVC-Advantage™. Works on 1080i high definition monitors. Better particle capture, better efficiency and long filter life! 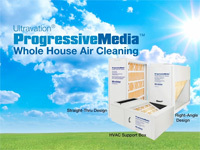 Ultravation® ProgessiveMedia™ air cleaners are designed be the most efficient, effective, and easy to use filters available — totally practical whole house air cleaning. Movie trailer featuring Ultravation™ ProgressiveMedia™. Works on 1080i high definition monitors that can be turned sideways..
Movie trailer featuring Ultravation™ ProgressiveMedia™. Works on 1080i high definition monitors. Learn about relative particle size of common indoor air pollutants including mold, dust mites, MRSA and more. 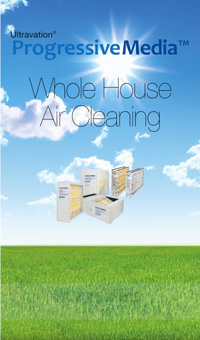 There is an Ultravation product to combat each of the shown indoor air irritants. An UltraMAX™ EZUV™ air treatment system is an economical yet effective way to automatically clean the air of unwanted germs, allergens and odors. An UltraMAX EZUV™ Signature Series uses T3™ technology germicidal UV air and surface treatment for HVAC systems. The EZUV Signature Series harnesses more UV power for healthier indoor air for your entire home with less energy consumed! A video highlighting the features and benefits of the Ultravation UVPhotoMAX Signature Series and the UVPhotoMAX PTE Series, along with the benefits of Ultravation air and surface disinfection for HVAC. One good thing leads to another. The success of the Ultravation UVPhotoMAX whole house advanced oxidation air purifier was the inspiration for the new UVPhotoMAX Signature Series. Ultravation's part owner and chief engineer Bill Fowler personally pulled out all the stops to make it much lighter, totally modular with a very small footprint, and 24-240 VAC Smart-Power. This means the Signature Series is even easier to install, easier to service, and of course destroys odors and kills germs better than ever! Each individual slide in jpg format that can be used on a tablet or computer. UVCatalyst™ is for whole house odor reduction and the disinfection of airborne bacteria, viruses and mold without adding anything to the air such as perfumes, ozone or active ions. 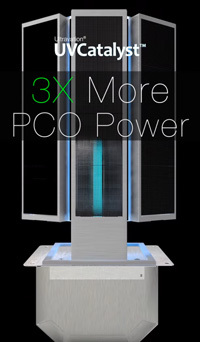 Its three panels of activated carbon cells provide the air purifying power for whole house effectiveness, and it installs out of the way in HVAC ductwork. Movie trailer featuring Ultravation™ UVCatalyst™. Works on 1080i high definition monitors that can be turned sideways. Movie trailer featuring Ultravation™ UVCatalyst™. Works on 1080i high definition monitors. Movie trailer featuring Ultravation™ Aquatronic™. Works on 1080i high definition monitors that can be turned sideways. Movie trailer featuring Ultravation™ Aquatronic™. Works on 1080i high definition monitors. The UVMatrix SI-Series uses UVC light to disinfect HVAC coils in large air handlers. The benefit is improved indoor air quality (IAQ) and clean, efficient HVAC operation with reduced maintenance and energy costs. The Germies™ & Friends present a short movie on "How Ultraviolet Light Disinfects". Movie trailer featuring Ultravation™ ProgressiveMedia™. Works on 1080i high definition monitors that can be turned sideways. A single video featuring UVPhotoMAX, ProgressiveMedia, Relative Particle Size animation and Ultravation Manufacturing. A video highlighting the features and benefits of Ultravation UVC-Advantage, and the benefits of Ultravation air disinfection for HVAC. A video highlighting the features and benefits of Ultravation UVCatalyst, and the benefits of Ultravation air disinfection for HVAC. A video highlighting the features and benefits of Ultravation EZUV, and the benefits of Ultravation air and surface disinfection for HVAC. A video highlighting the features and benefits of Ultravation UVPhotoMAX Signature Series, and the benefits of Ultravation air and surface disinfection for HVAC. A video highlighting the features and benefits of Ultravation Aquatronic UV water treatment. 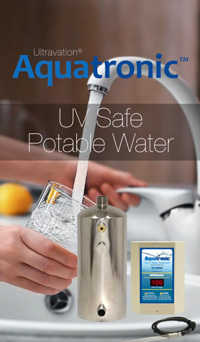 Ultravation® Aquatronic™ UV disinfection systems use ultraviolet light to disinfect household water. They are designed to provide consistent potable water for drinking, cooking and bathing in either 10 or 20 gallons per minute configurations. A video highlighting the features and benefits of Ultravation ProgressiveMedia.